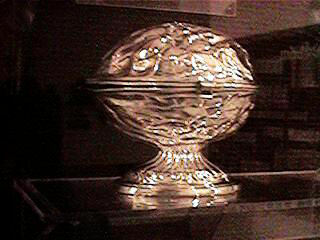 Etrog Container. Germany. 19th century. B'nai B'rith Klutznick National Jewish Museum, gift of Mrs. Lawrence Konigsberger. Sukkot is a Biblical pilgrimage festival that occurs on the fifteenth day of the month of Tishrei (late September to late October.) The holiday lasts seven days, including Chol Hamoed. In Judaism, it is one of the three major holidays known collectively as the Shalosh Regalim (three pilgrim festivals), when historically the Jewish populace traveled to the Temple in Jerusalem.